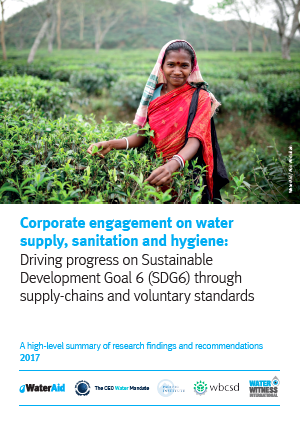 This report recognizes the need for successful corporate water stewardship to encompass sustainable access to water, sanitation, and hygiene (WASH) for workers in company supply chains, and offers steps for companies to take to help end the global water and sanitation crisis. Corporate Engagement on Water Supply, Sanitation and Hygiene: Driving Progress on Sustainable Development Goal 6 (SDG6) Through Supply-Chains and Voluntary Standards finds that socio-economic water risks to business can only be mitigated when there is universal and sustainable access to WASH for workers. Significant potential for progressive action on WASH through corporate supply chains exists, depending on the supply chains’ reach and scale, locations in supply countries with high gaps in WASH access, and links to under-served communities. Corporate action on WASH can drive improved access for vulnerable communities, as well as economic and social development. Sign and implement the WBCSD WASH at the workplace pledge ensuring that all employees in direct operations have access to safe WASH while at work. Broaden and deepen employee and company understanding about WASH by providing them with the International Labour Organization’s WASH@Work Self-training handbook. Update supplier codes; a draft set of criteria for optimal water, sanitation, and hygiene provision in supply chains is available for pilot testing by companies. Contribute to strengthening the business case for WASH by offering opportunities for evidence-gathering from their operations and projects. Learn about and engage in the WASH4Work initiative, working with a group of agencies, companies, and development partners to address the WASH challenge. The United Nations Sustainable Development Goal 6 (SDG6) calls for universal and equitable access to safe and affordable drinking water for all by 2030. View and download the full report in English here.